1. Put all the ingredients, apart from 1 tbsp pine nuts, in the small bowl of a food processor and whizz until relatively smooth, scraping down the sides of the bowl if needed. Season. 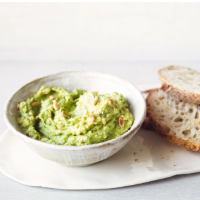 Stir through the reserved pine nuts and serve as a pesto for pasta (stirred through with a little of the starchy cooking water to loosen), eat as a dip with crudités or spread on crusty bread.